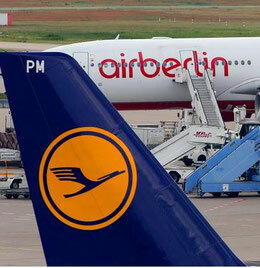 Lufthansa takes over large parts of the insolvent airline Air Berlin. Both companies announced that they have inked a purchase agreement this noon (19 Oct). All Air Berlin employment contracts will be cancelled, affecting roughly 8,000 staff. The settlement reached with AB’s liquidator includes these key issues: the takeover of 81 leased Air Berlin aircraft by the LH Group of airlines for a guarateed price of €210 million, the acquisition of the AB daughters Niki and Luftfahrtgesellschaft Walter (LGW), as well as the hiring of 3,000 staff of the insolvent carrier by LH and predominantly Eurowings, Lufthansa’s low cost arm. On the occasion, LH CEO Carsten Spohr emphasized that air fares won’t go up as result of the deal but will generally continue to fall instead due to harsh competition particularly on regional European routes. "The competition will intensify in Europe and worldwide," he told the press, thus distracting concerns about price hikes on routes served mainly by LH after AB's upcoming market exit. "In contrast, we are assuming further price reductions,” he said. Many of the regional routes served by Air Berlin up to now or its subsidiaries will be taken over by Eurowings, Spohr confirmed. Spohr also offered stranded AB passengers “a fair ticket price” to fly them back home, provided Eurowings’ or LH’s capacities allow these transports. How many travelers are affected is unknown but it is estimated their numbers reach tens of thousands. In a statement, Air Berlin said they expect good chances for about 80 percent of the remaining 5,000 staff that are not part of the LH deal, to get new jobs at other airlines. The carrier also announced the termination of its airline code AB as of 28th October. The entire LH-AB deal still has to be officially ratified by the EU Commission. At this stage of negotiations the fate of the remaining roughly 30 aircraft of the AB fleet is unclear. EasyJet is still a candidate to take over the equipment together with some of the routes and slots. A potential buyer for Leisure Cargo and the technical services of Air Berlin is forwarding agent Zeitfracht, as their speaker Thomas Schulz confirmed to CargoForwarder Global. "Last Monday we have submitted an unconditioned tender for AB Technik and Leisure Cargo, but haven't received any feedback from the insolvency administrator up to now." The bid was submitted by Berlin-based Zeitfracht in accord with its technical partner Nayak Aircraft Services of Cologne, sources say. It is still somewhat unclear whether Eurowings will increse their long-haul services to take over part of the now dormant Air Berlin Caribbean, USA and Far East Destinations. This will be of importance for any potential candidate to take over Leisure Cargo. Presently, LH Cargo is responsible for the cargo sales on Eurowings long-haul destinations. Lufthansa shares rose by over 3% today on the German Stock Market (DAX) due to the positive reaction on the AB deal. Sources within German political and aviation circles are stating that Lufthansa is also having a serious look at taking part or all of the ailing Italian national carrier, Alitalia. It is said that LH’s CEO Carsten Spohr may well be, under certain conditions, interested in investing in, or taking part of Alitalia. Spohr stated that "Italy is an important market for us. Alitalia as it stands today is not of interest. However, should a new start become possible, then things may well look different." Interested parties for an Alitalia takeover must submit their bids by latest coming Monday (16. October). Ryanair has withdrawn from bidding and it remains to be seen whether Lufhansa will submit their own bid by then.